The most frustrating part about the Modern banlist isn’t always the bans themselves. In fact, I haven’t really disagreed with a ban since Seething Song/Bloodbraid Elf bit the dust back in January 2013. For me, the most frustrating part can be lack of player understanding about Wizards’ banning criteria, and Wizards’ lack of transparency in how they discuss those criteria. With a banlist announcement scheduled for July 13 (scroll down in that linked article), the Modern community is going crazy around a bunch of cards that should be banned and Wizards is characteristically silent. Why couldn’t summer just be about the awesome GPs we just finished? Instead of jumping on that ban-mania train, I want to drill down on the ban criteria themselves and then make some predictions based on both those criteria and Wizards’ history of bans. If you were looking for an article about a new cutoff for the Modern format, banning a half-dozen cards to supposedly fulfill the turn four rule, or unbanning Jace, the Mind Sculptor and Stoneforge Mystic to enable control in Modern, then this article will be a little disappointing. But if you want to keep some perspective on the banlist and situate possible (un)bans in the broader Modern context, then hopefully this article will help you think through the Modern banlist announcement coming up on July 13. Top-tier decks can’t consistently win the game before turn four. No deck can be greater than a certain percentage of the metagame for a sustained period of time. No deck can push out other decks below a certain percentage. No card can be so strong that you must play that card if you are playing its colors. Decks can’t cause rounds to go to time. Again, the March 23 banlist prediction article went over all the evidence and sources supporting these rules. To some readers and Modern players, it probably feels a little pedantic to go over these criteria again (and again, and again…). But one reason it’s so important is that I see all sorts of ban suggestions that are either related to these rules only in the most tangential sense, or just totally unrelated in every sense. For instance, I’ve heard some players advocate for a Blood Moon banning. Where exactly does that fall with respect to these criteria? It’s not too fast, doesn’t fit into an inordinate share of decks, isn’t required in those colors, and doesn’t screw with tournament logistics. I guess it’s “not fun” to be under a Moon, but “not fun” isn’t a banning rule, even if many Modern players believe it is. The only card to ever be banned under some variation of that rule was Golgari Grave-Troll (to eliminate the dredge subgame). But Troll has since been unbanned, and the only card from dredge still on the list is Dread Return, not because it isn’t fun but because it’s a turn 4 rule violator. The point here is that we can’t just invent rules because they feel right to us when we are mad at one deck or the other. We need to always return to the criteria Wizards laid out because, in many cases, this was Wizards’ way of operationalizing the arbitrary and subjective “not fun” feeling. Looking ahead to July 13, most of the ban discussion I see revolves around the turn four rule. This is certainly true of stuff like Amulet of Vigor, Summer Bloom, Become Immense, Griselbrand, and a dozen other cards I’ll touch on later in the article. Because this rule is so central to the upcoming ban announcement, or at least the community’s dialogue around it, I want to break it down here. This can help us gain a better understanding of how the rule has worked out in practice and where we might see it again. After all, the rule is actually much more complicated than it seems at first glance. It’s easy to forget Wizards’ process in choosing turn four instead of turn three or turn five. As Tom LaPille explained in the seminal “Welcome to the Modern World” article, “… we have a rule of thumb about Legacy that we don’t like consistent turn-two combination decks, but that turn-three combination decks are okay. We modified that rule for Modern by adding a turn to each side.” This seems reasonable at first glance, but makes a lot less sense in the context of Legacy, where decks like Invigorate and Berserk-fueled Infect are perfectly acceptable. Part of this is the higher quality of police cards in Legacy (e.g. Force of Will) which allow faster decks to exist: contrary to popular belief, the average Legacy game is actually slower than the average Modern one in many cases. But this interplay between police cards/policing decks and broken/fast ones is lost in the translation of Legacy’s so-called turn three rule and Modern’s turn four one. Of course, we’re stuck with the rule for now, but it’s interesting to see how the rule’s origin was itself framed so ambiguously. At first glance, this seems like the most obvious part of the rule. How unclear can “win the game” really be? As with many aspects of Modern ban policy, the answer is “way less clear than you expect”. First, there are cards that actually win the game like Blazing Shoal and Blighted Agent. But there are also cards that virtually win the game. A possible example of this is something like turn three Iona, Shield of Emeria off Dread Return. Or a turn two Primeval Titan with six lands in play. Or, returning to an example I made fun of earlier, a turn two Blood Moon. This issue was complicated further in a recent Sam Stoddard article, “Development Risks in Modern“, where he wrote “[this is] not the sort of game play that we want to encourage in Modern. Turn one: make a huge play. If you can beat it, you win; if not, I win.” The problem here is that “huge play” is much more open than “smack opponent for ten poison on turn two”. For me, the key to understanding the degrees of “win the game” is in assessing an opponent’s options once the “win” is in play. Obviously, the ten poison win doesn’t leave you a whole lot of outs once they are there. But Moon does. So does Titan. The longer the game goes on after a “win” is in place, the less this is really just a guaranteed “win”. This is one helpful way to understand the distinction. This is at once the most refreshing metric of the turn four rule and also the most frustrating. On the one hand, “consistently” suggests there is a defined cutoff Wizards looks for when assessing decks. If a deck wins on turn three or earlier more than N% of the time, it is in violation of this metric. This was certainly suggested (everything but the value of N itself) in the Seething Song ban in January 2013: “Looking at the results of games, turn-three wins are frequent for Storm, contrary to the DCI’s stated goals for the format.” So in the case of Song, there really was a cutoff the deck violated, even if we don’t know what that cutoff is. In many respects, it’s heartening to know there is some N% out there that Wizards defers to. But this, of course, brings us right to the frustrating piece: the community doesn’t actually know what N% is. I fully appreciate Wizards’ unwillingness to share this number because a) it is probably arbitrary and would just incite argument in the community and b) it limits their flexibility and discretion as ban agents. But I also wish Wizards was more open in its communication so as to limit ban-mania and misapplied ban predictions. From Stoddard’s article, we also know that interactivity is a part of this, which is also to say that Wizards doesn’t care about win percentages in goldfishes: “Most of the super-fast combo decks in Modern that can win before turn three on a regular basis tend to do so in a way that we can expect most decks to easily interact with.” This complicates the issue further because it suggests both an N% cutoff Ii.e. the “regular basis”), but also a kind of deck (e.g. one that isn’t “interactive”). The best way out of this is to compare new potential offenders of the turn four rule to decks that have already been found to be safe. Infect is the big one here, because it has dodged bans for years and Stoddard even mentions it in that above article. Back at the dawn of Modern, Wizards defined the turn four rule in absolute terms: “we are going to allow turn-four combination decks, but not decks that consistently win the game on turn three.” The problem with this rule, which Wizards probably realized, is that this includes way too many fringe decks that aren’t actually competitive. Do we have to ban Immolating Souleater and/or Assault Strobe because it CAN win the game on turn three in a goldfish setting? Or a small event? Because of this, and because of the format’s evolution after PT Philadelphia in 2011, Wizards revised the rule to include the top-tier qualifier: “With the results of the Pro Tour in, we are tweaking that goal to not having top-tier decks that consistently win on turn three (or earlier)”. On the one hand, this redefinition was quite welcome because it suggests an objective standard. On the other hand, as with the “consistently” metric, we don’t really know how Wizards qualifies a top-tier deck. We know that Storm was considered top-tier with an 11.42% MTGO metagame share, but we have no idea if that’s an upper-end of being top-tier or a lower-end. Would 10% cut it? 8%? The only way to tell is to triangulate the cutoff based on what is and is not banned, but even this is tricky because it’s unclear whether a deck avoids banning because it isn’t consistent or because it isn’t top-tier. If this analysis of the turn four rule has left you with more questions than answers then congratulations! You are now appreciating the complexity of analyzing Wizards’ ban decisions and predicting their next moves. This is the level of detail and depth we need to go to if we are to understand how Wizards gets things done around the banlist. Of course, it’s possible that Wizards just throws darts at a board and doesn’t go through this kind of calculus, but I suspect it’s much more nuanced than the Unglued card suggests. Given that Wizards has been incredibly conservative with their application of the turn four rule (the only card to be banned for it since PT Philly has been Seething Song, I bet they really do think through this issue seriously and touch on all these points we looked at here. GP Charlotte was my favorite Modern GP since GP Richmond, but man oh man did I hate those questions the commentators asked players in front of the camera. Between the Amulet Bloom ban interrogation and the “what would you ban in Modern” line, it was a really unfortunate way to frame the format. It was especially unfortunate given how healthy the format is looking right now: see my recent 6/1 – 7/1 metagame breakdown for more information on this. This is the metagame context we are working from, and we need to consider these datapoints, the criteria discussed earlier in this article (especially around the turn four rule), and our general qualitative and experience-based understanding of the format. Based on all this, here is the single banlist scenario I expect for July 13. If you read my metagame breakdown article yesterday, you already knew this was my big prediction going into Monday and that’s still true now. The format is looking extremely healthy by almost every metric, or at least every metric Wizards has cited in past ban decisions. No single deck has a metagame share over 11%, let alone the 15%-20% shares we saw during Treasure Cruise‘s and Birthing Pod‘s reign over the format. We also aren’t seeing any polarizing decks in individual Modern settings, whether the SCG IQs, MTGO, the GPs, etc. We entered June with some question marks around a few decks. Splinter Twin combo was looking pretty strong, and although both Grixis Twin and UR Twin put up respectable numbers at the GPs, they just aren’t even close to the prevalence we would expect of a bannable deck. At one point, UR Twin alone was about 12% of the metagame. Today, you need to combine all three Twin archetypes to get to 12%-13%, and those are just metagame-wide numbers. It’s not like Twin is preventing other combo decks from thriving (Ad frikkin Nauseam got Top 8 at Charlotte! ), or even other blue-based control (Grixis Control is here to stay). So from a pure diversity perspective, it’s not like the format’s big URx threat is nearly as big as people made it out to be. Speaking of big threats, what happened to decks like Amulet Bloom and Grishoalbrand? Quite simply, they aren’t even close to top-tier status by any indicator Wizards has used in the past. Looking to the Song ban, our most succinct explanation of the turn four rule in action, we see Storm was classified as top-tier based on a 11%+ MTGO share and a few T8 performances at GPs. Although combo decks like Amulet do make some random Top 8 and Top 16 appearances from time to time, they are nowhere close to the Song-style metagame shares we saw in January 2013. Amulet is just under 5% of the MTGO metagame. Grishoalbrand is under 3% of every metagame, and under 1% of paper. These are just not the numbers you expect to see of “top-tier” decks. I would be surprised, stunned, and honestly appalled if Wizards spun a story about any of these decks meeting top-tier criteria with these kinds of numbers. If they do then ladies and gentlemen, all bets are off as to how Wizards perceives this format and how they understand our metagame. But because Wizards has been so rational in the past, I don’t think we need to worry about this. Level heads will prevail and find that no deck violates any of the format’s rules, least of all the turn four rule. The metagame data in the 6/1 – 7/1 article also strongly suggests there will be no unbans in this period. When no single deck makes up more than 10% of the format even after a month with three GPs, you know we are talking about an open metagame. Those are the numbers we would expect during an offseason, not one where players are clamoring to find the best deck with GPs and pro points on the line. Because the format is so stable, we are unlikely to see any unbans that might shake it up it. Sword of the Meek? Not when Burn and Affinity are both under 10% of the metagame. Bloodbraid Elf? Jund is the most-played deck in the format. Why on earth would you think a Bloodbraid unbanning is timely? Ancestral Vision? Grixis Control just proved that blue-based control can succeed in Modern without any additional help, and Wizards is unlikely to want to power that up further (sorry, Jace). When you add to this the recent release of Origins and the potential impact of cards there and in Battle For Zendikar, it becomes even clearer that we are unlikely to see any unbans in such a diverse moment of Modern. For unbans to occur, we would need a stagnant and/or solved metagame, and we are very far from that now. We could also see unbans if Wizards felt a particular deck was too strong and an unban could be targeted to address it. That’s the Sword case in a nutshell, but we just aren’t seeing an aggro hegemony to justify it right now. Maybe that changes after Day’s Undoing hits Burn and Affinity in the next few weeks, but the current data does not suggest aggro needs any reining in. If we see bans on Monday, it will signal a huge paradigm shift in how Wizards views the format. We will have to redefine all our expectations around metagame diversity, and all our understanding of how decks are considered “top-tier” in the eyes of Wizards. Right now, most players and Modern stakeholders (this site and I included) have a certain conception of what it means for a deck to be “top-tier” and what it means for metagames to be “diverse”, “open”, and “healthy”. Bans on Monday would undercut all the research and results we have gathered from the format so far. We would have to reassess not just our knowledge of Modern, but also Wizards’ treatment of it. Thankfully, I am confident that nothing like this will happen once the announcement goes live at 10:00 AM CST on Monday. Modern looks very healthy by most metrics, and I can’t wait to get past the 13th and back to playing decks, brewing lists, and analyzing the metagame results of the next few PPTQs. Any other thoughts on bans or unbans? How Wizards applies the ban criteria? Any predictions of your own? Let me know in the comments and definitely check back in here on Monday when we launch a quick piece reflecting on the Modern banlist announcement. What’s with this Sword of the Meek talk I see popping up more and more, recently? Get it out of your head people, this card has nothing to do with “Burn and Affinity”, it is not matchup- or metagame-dependant. 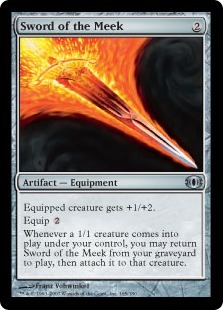 It is banned because of the combo it makes with Thopter Foundry and the two are just way too powerful for Modern. They are two artifacts that create a board state by themselves (artifacts – aka those things that don’t die to Bolts), generate bodies and life… practically infinite, as long as you keep pumping mana into them. They are in the colours of Academy Ruins, which makes interacting with those cards an exercise in futility. It’s unhealthy for Modern’s limited power level and available interaction cards, it’s powerful, cheap, indisruptable and the worst part is that nothing else can really match that threat level, outside of combo… and it’s in the perfect colours do disrupt combo. So no, stop talking about it, we WILL NOT be seeing Sword of the Meek anytime soon, unless Modern evolves to the point where it’s power level nears that of Legacy (it won’t take too long, the majority of Legacy is pretty much Modern-legal… all we need is a decent emulation of the “legacy police cards” like Force of Will and we’ll get there… but I hope we don’t, ever). Sheridan already called a Sword unban unlikely in his article, so you’re preaching to the choir. It has a lot to do with “Burn and Affinity” since those are the decks the combo of Sword + Foundry hoses the most, just as a Jace unban has everything to do with the viability of control and midrange; if the meta became 80% linear for a reason Wizards could not control with a banning, a strong case could be made the Planeswalker’s removal from the list. Everything is contextual. Although Thopter/Sword isn’t a great early-game answer against aggressive decks, it’s an excellent turn four-five stabilizer in those matchups. Most aggressive decks aren’t actually beating the slower strategies on turn four. They just gain early leads and hammer away, typically winning closer to turn six. It’s not as if a deck like Grixis Control has no interaction whatsoever: it’s just that something like Burn is going to build a huge lead and then just win off topdeck mode. Sword addresses this issue by giving decks some stabilization power and inevitability against those linear, damage-based decks. But that leads to the current metagame picture: we don’t have nearly enough linear, damage-based decks to justify unbanning such a potentially powerful card. As for Sword being format warping, I’ve heard that three times before, once about Valakut, once about Bitterblossom, and once about Nacatl. In each of those cases, the card either slotted into a fair spot in Modern or basically fell off the radar. Sword is on the same power order of magnitude as those cards (maybe a tiny bit higher), so it is unlikely to perform that much better. sword is totally fine with decay and the br command legal. It is very easy to deal with and the lack of the Dark Depths combo, makes the deck much less powerful. I think the format could withstand unbanning either Stoneforge or Jace, but not both, and my vote would be for Jace (and this coming from a mono-White Death and Taxes player). Stoneforge is a bit too much (as is Jace, to be honest). I’d love to have it in my D&T deck, of course, but it wasn’t a suspect ban like most early bans, it was a proven one. Stoneforge into Batterskull is not even close to as unfair as what Burn, Infect, Amulet and Grishoalbrand are doing. White is all but dead in Modern (especially since Jund overtook Junk). Would it be powerful? Of course it would, but no worse than what’s going on in Modern currently. Stoneforge is a viable unban when you are stuck in a whiteless metagame. But Jund only recently surpassed Abzan (i.e. a month ago), so it’s not like we are in some longstanding dearth of white results. This is the sort of unban you want to do when the metagame is fairly stagnant and white is nowhere to be seen in tier 1 (and practically nowhere to be seen in tier 2). Only then can you MAYBE consider a Stoneforge unban. But we definitely aren’t there right now. Jace is the kind of card you unban when blue-based decks are floundering and control is nowhere to be found. Or you unban him to cushion the impact of some bigger ban (a strategy Wizards hasn’t actually used, but it’s possible). We just don’t have a metagame that is so devoid of blue decks and control decks where this is needed. Also, although price is not a criterion for banning, it is surely on Wizards’ mind in considering a JTMS unban. This card would be $300 overnight, or even higher. While I agree that nothing will get banned or unbanned this announcement (unless if the format is in big trouble they save banlist changes for before the Pro Tour), Sword of the Meek barely affects Burn and Affinity. It is a slow combo that usually will not be assembled until the late-game, that has pieces that do nothing without each other (unlike Splinter Twin), and even in the best case scenario that involves spending all of turns 2 and 3 deploying the combo, it still only makes one thopter and gains 1 life before turn 4. Burn and Affinity can easily win through that while on the play. And even if they couldn’t, getting the turn 3-4 combo is still pretty rare. It also is easily beaten by graveyard hate and artifact hate. Most importantly, it helps Control a lot. Even if Grixis Control counted as Control, Control would still be far less than 20% of the metagame, which is horribly imbalanced. Sword of the Meek definitely should be unbanned. It can’t hurt Modern and can only help it. I really like this article. Congratulations. I expect a summer bloom ban though. In my opinion this card is like red shoal, difficult to interact with especially on the draw. The deck would survive using explore, less explosive but allowing to drop a titan a turn later. On the unbaning side, SotM, AV, BBE should be candidates to come off at some point to shorten the list but I wouldn’t touch anything now. Remember that Bloom can only violate the turn four rule insofar as it is a top-tier deck. If Wizards defines Amulet Bloom as a top-tier deck, this means we are either woefully underequipped with our data (and Wizards has a totally different picture than the public can access), or Wizards is totally out of touch with the format and how top-tier decks are defined. Or, as another option, Wizards has a completely different definition of top-tier than most people do, which would be equally worrisome. Amulet Bloom’s MTGO share is less than 5%. Its paper share is even lower. The deck didn’t even Top 8 a single GP all June, and only got Top 16 at GP Singapore. Compare this to Storm, which had a few T8s and 11%+ of the MTGO metagame when Song was banned. If Wizards uses the same logic to ban Bloom as they did for Song, that’s seriously warped and would reflect a major disconnect between Wizards and the community. I still think, if that deck eats a ban, that Hive Mind is the best choice as it leaves the deck mostly intact and eliminates most of what people hate about it. That said, the deck just isn’t putting up the finishes and format presence to justify it. There are also a number of answers in the format, but this has been addressed so many times it really isn’t worth rehashing. The short version is that a high MWP likely isn’t enough to constitute a ban, but I’d rather see a slap on the wrists than a disemboweling. It’s a cool deck and I want to see it stick around. A likelier ban will probably be Summer Bloom, which is effectively a ritual in the deck. We already know Wizards loves banning rituals (Rite of Flame, Song), and Bloom is the main card which makes the deck so fast. Winning with Hive Mind on turn 3-5 is fine. Winning with it on turn 1-2 is not. Removing Bloom forces Amulet players into Explore, more Azusa, and/or Journey of Discovery, none of which are nearly as fast. Reasonable ban talk is the best! Glad to hear you enjoyed the article (and glad to hear that you are equally fed up with the unreasonable ban mania).